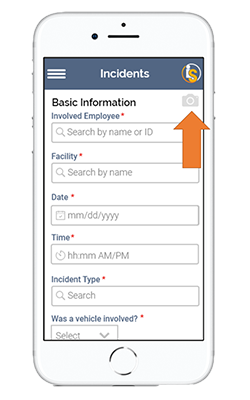 Users that have access to IndustrySafe's Incidents Module can now use the mobile app to complete Initial Incident Forms. 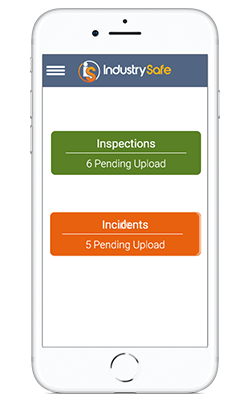 To enable the Incidents Module within the mobile app for your organization, please contact IndustrySafe's Support Team at support@industrysafe.com. After the module is enabled, upon logging into the app, you will then be prompted to select a module if you have access to both the Incidents and Inspections Modules. If you have any pending records for the module you've selected, you'll be taken to that module's pending queue, where you can edit or upload your pending forms to IndustrySafe Safety Management Software. If you do not have any pending records, you'll be taken straight to the Basic Information section of that module's form, and can begin entering in your data. You can add attachments and create and link corrective actions to incidents if needed. Once an internet connection is established, you can submit your incident data to the IndustrySafe Software so that you can conduct further investigation of the incident and fill out additional incident forms as needed. If an internet connection is not available, the incident will be saved to the your pending queue and can be uploaded to IndustrySafe when connectivity is available. System administrators can determine which Initial Incident form fields are available within the app using IndustrySafe's Initial Incident Form Editor. As part of this release, the process of adding attachments to forms has also been improved. A new camera icon has been added to all sections of Initial Incident, Inspection, and Corrective Action forms so that you can add attachments to records at any time without having to navigate to the Additional Features section of forms. IMPROVEMENT: You can now reset your password by clicking the "Forgot Your Password" link within the app's log in screen. FIXED: Video files were not being successfully attached to inspections. FIXED: When the checklist contained a large number of status values, the dropdown did not allow you to select status values from the bottom of the list. FIXED: Intermittent app crashing after a user chooses a category and checklist and then navigates to the Inspection Form's Basic Information section. FIXED: State names were not displaying within the Corrective Action Form's "State" dropdown field. FIXED: Disordered fields in the Inspection form's Basic Information section. FIXED: Inspection Upload issue impacting forms using advanced settings. FIXED: Users will no longer be prompted to save their incident form when leaving the incidents module if no data has been entered into the form.